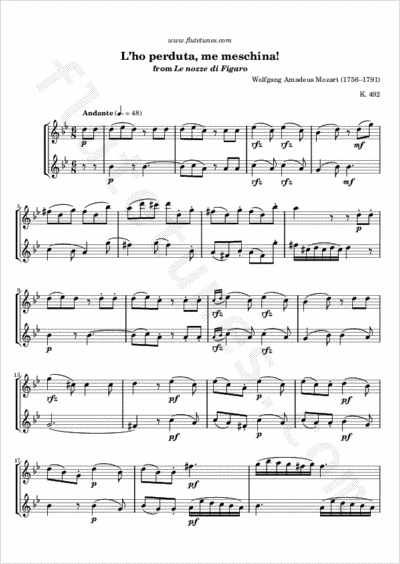 Sheet Music: L'ho perduta, me meschina! Tune of the Day: L'ho perduta, me meschina! The title of this aria literally means “I have lost it, woe is me!”. It is taken from the very beginning of Act IV of Mozart's opera Le nozze di Figaro, and is sung by Barbarina, Susanna's cousin. Terribly upset, Barbarina is searching the garden for something that she has lost. When Figaro arrives with his mother Marcellina and asks the weeping girl what's wrong, she replies that she has lost the pin that the Count gave her to deliver to Susanna as a token of their tryst. Angry, but pretending that he already knows all about it, he plucks a pin from Marcellina's dress and gives it to Barbarina, who goes off to give it to Susanna. Figaro collapses into his mother's arms, then rage overtakes him as he vows to avenge all deceived husbands.